HONK! Fest West, Here We Come! Our fundraiser at Hopmonk this month was an incredible success! Thank you to all the band members, supporters, fans and other folks who helped us out. We had a super fun party and raised enough money to make sure that our band gets up to Seattle for HONK! Fest West on June 21st through 23rd. HONK! 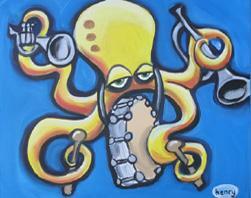 is where street bands like the Hubbub Club come together to exchange ideas and create free and dynamic music performance in the street. It’s for young people, old people, fat and skinny people, beginners, professionals, baton twirlers, artists, and performers of all kinds. If you’re up in Seattle that weekend, please come celebrate with us.